FRANKFORT, Ky.— Kentucky National Guard Soldier Master Sgt. 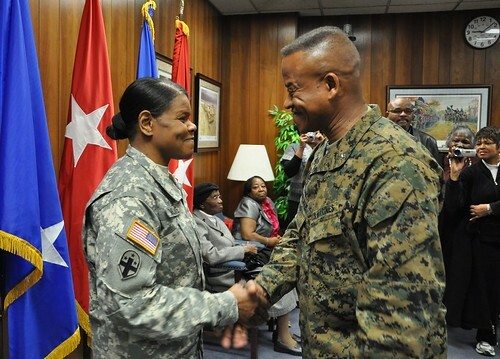 Janet Timberlake was promoted to the rank of sergeant major by her brother, Marine Brig. Gen. Craig Q. Timberlake, during a ceremony at Boone National Guard Center Dec. 11, 2012. 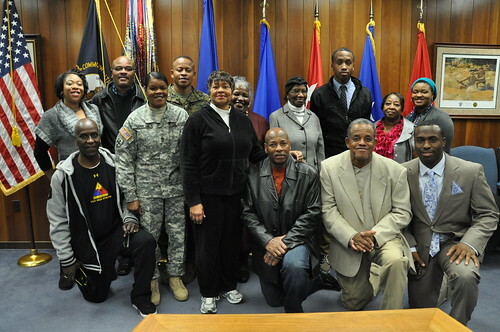 Janet Timberlake is the Joint Operations Center non-commissioned officer in charge and is the first Kentucky National Guard black female to be pinned a sergeant major, the highest enlisted rank in the Army. To see more photos from the promotion ceremony, click here. Janet Timberlake began her military career in 1982 with the 475th Mobile Army Surgical Hospital. MASH’s wartime mission was to bring emergency lifesaving surgery closer to critically wounded casualties. Ironically enough, in 1985, Janet Timberlake met Command Sgt. Maj. Pat Copas, fellow Kentucky Guardsmen and the only other female promoted to sergeant major this year. Since joining the military, Janet Timberlake has deployed in support of Operation Desert Shield, Desert Storm and Iraqi Freedom. Janet Timberlake’s brother, Craig Timberlake, is the commanding general of the 3rd Marine Expeditionary Brigade located in the Pacific Area of Operation. He flew in to Frankfort, Ky., from Okinawa, Japan to participate in the honor of pinning his little sister to the hard-achieved rank of sergeant major. Craig Timberlake was once a staff sergeant and later commissioned and climbed the Marine ranks to brigadier general. In attendance, Janet Timberlake had 12 total family members at the ceremony to include her other two bothers Rickey and Vincent Timberlake. Her grandmother Cynthia Wright and aunt Addie Wright who raised her and her brother after the loss of their parents at an early age were also in attendance. Copyright Kentucky National Guard. All Rights Reserved.